Tonight, social network platform Ning is giving users a new, more customizable way to interact with their social networks with the launch of Ning Everywhere. Ning CEO Jason Rosenthal says that network creators were asking for three major improvements in the Ning experience. First, users wanted to be able to take experience of Ning and bring it to any device. Second, creators wanted to take data and content from their networks and use this data outside of Ning. And third, users wanted to be able to write custom apps on top of networks that add functionality and features to networks that Ning doesn’t provide. Thus, Ning Everywhere was born. 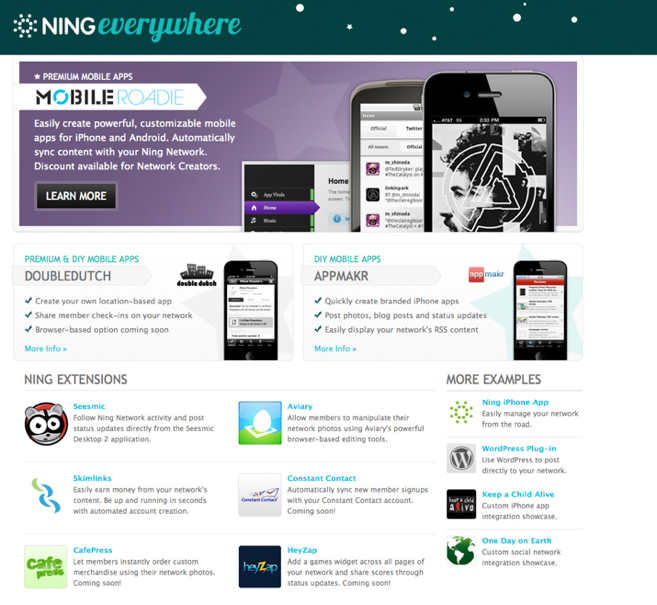 The first part of Ning Everywhere involves mobile applications. Ning has developed partnerships with several mobile application creation platforms, including Mobile Roadie, Double Dutch and AppMakr, to allow network creators to create branded iPhone and Android apps for Ning Networks. For example, Mobile Roadie developed the Linkin Park iPhone app that includes integration with the band’s Ning network. Ning Everywhere’s second pillar involves Ning Extensions which allows network creators to integrated Seesmic, Constant Contact, Aviary, and Skimlinks on Ning Networks. Ning already added branded product creator Cafepress and social gaming startup HeyZap as ways for creators to monetize off of the site. Seesmic’s integration allows users to follow a Ning network activity from Seesmic’s desktop application as well as post status updates to networks. Email marketing software Constant Contact allows network creators to integrate member contact information into the service and also enabled delivery of email newsletters. Design suite application Aviary gives network creators graphic design and audio and effects editing tools. And Skimlinks will give users the ability to run affiliate marketing campaigns, giving creators the ability to automatically convert words and normal links into affiliate links. Lastly, with a new version of the Ning API, Network Creators can build their own applications off of the platform. Ning has been through a tumultuous year, suffering layoffs and shuttering its free service. In May, Ning rolled out the different paid models for its platform, Ning Pro, Ning Plus and Ning Mini. But the dust has finally settled and Ning is seeing a large uptick in its paid subscribers. The platform now has over 70,000 paid subscribers, up from 15,000 from before transition from the freemium model. Rosenthal says that the network is currently seeing 80 million monthly unique visitors globally.